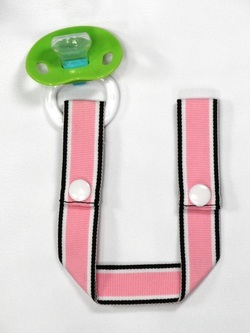 A Paci-Tether is the most superb, UNIVERSAL pacifier tether (or pacifier strap/clip) available today. It's universal, which means it fits ALL makes and models of pacifiers. No adapters, or strings to come undone either. It is one piece and it's SO incredible that it is patent pending! Is it just for pacifiers? No. Tether juice box holders, snack cups, teethers, toys, and more. This tether can also grow with the consumer! Use it to tether a lunch bag to a backpack, hair bows to a hanger, keys to a diaper bag, a badge or ID card to brief case, or even a cosmetic bag to a suitcase. Is there a Printable Fact Sheet?